Lobster is one of those foods that really live up to the hype. It's not like caviar, or oysters, which everyone pretends to love when they materialise, but secretly thinks they're a bit gross. I have a friend who lives in Mullaghmore, a rugged beach area in Co. Sligo. There's a lobster man who calls door to door, selling whatever has popped up in his lobster pots that day. He sells them for about €3 a pop. That's the kind of offer you just can't turn down. They started eating so much lobster, even the cat was getting it. "I'm getting sick of it at this stage, to tell you the truth"
"Hmm, yeah, I'm sure you are..." I mumbled, while wondering how much of a lobstery taste I would get it I were to start gnawing on her arm. I don't think I could ever get sick of lobster. Especially when it's dripping in garlic butter. Really, I would eat anything if I could dip it in garlic butter. 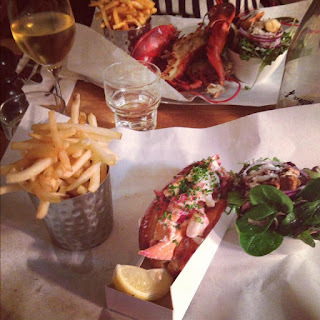 Which is why I was dying to go to Burger and Lobster when I was in London a few weeks ago. I was meeting a couple of old friends after work, and we all agreed it would be the perfect spot. The only problem is that a million other people thought so too. I've never eaten in a restaurant that I've had to plan for or wait at before. If I have to wait more than 30 minutes, I'm not interested. But we planned ahead. If you get there before 6pm, even around 5.45pm, there will only be a small queue and a bit of a wait. Get there afterwards, and you'll be looking at 2 hours at the least. The concept in Burger and Lobster is simple. The menu has three items - lobster, lobster roll and a burger. All come with fries and an annoying salad that you don't want to eat but feel pressured to by social convention. Everything is £20. If you go for the lobster, you can choose from steamed or finished on the grill, which is what I plumped for. Because there's only three items on offer, you get them almost instantly. Our table was practically in the kitchen, and the staff are on a pretty constant high speed lobster attack. Everyone else I was with had the lobster roll, which looked good (and was gorgeous, according to them) but the real winner seemed to be the whole lobster that I got. It was a beast, perfectly cooked, plump, sweet and constantly diving into my little urn of garlic butter. As were the fries. And my salad. I was in lobster heaven. A good few burgers went past as well, but really, would you be bothered? No. You want the lobster. It took my a while to get my head around just how many lobster must past through their doors each day. And with the numbers that this restaurant seats every day, the mind boggles. It's not the place for a long, ambling dinner. I didn't exactly feel rushed out the door, but it's not a place to linger. There were desserts on offer, one of which sounded amazing, a snickers style chocolate and caramel feast. But instead, we finished our wine, split the bill (which is the easiest job in the world with this menu) and head back out into Soho. I don't even like lobster that much, and this post had me salivating. Yum.